Post rut mortality is always a factor to contend with in any quality management or trophy management deer program, but our losses were particularly high after the 2002 season on Briar Lakes Ranch. Only months after the season ended NASA sent a crew of more than 80 people to scour our East Texas ranch for pieces of the Shuttle. Along with finding significant parts and debris from the tragic Shuttle flight, they also found two bucks that had succumbed to the rigors of the rut. Both of these bucks exceeded a gross score of 200 points. Add that to the one my son Trevor found dead, which scored 228, and you can imagine my depressed state after becoming aware of such severe post rut losses. 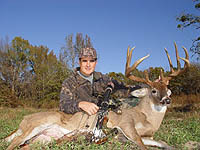 Before these finds I thought 2003 would be the first year I would have several giant bucks roaming the ranch when I entered the woods with my bow, but once again, I hit the woods with only one target buck on my hit list. This deer was a huge nontypical we had nicknamed “the Pirate,” after he lost his left eye in a fight. During several sightings of him in late summer, I was convinced he would score in the high 180s, and I would be proud to put him on the wall with some of my other bucks. After putting in about three full weeks of hunting for the Pirate I finally had an encounter with him in mid November. Unfortunately, he had broken off both his brow tines, a total of more than ten inches of tine length. I have always considered it a shame to kill an exceptional trophy when his rack has been significantly broken up, so I made the decision to call off the hunt until the following season. Since he was the only exceptional buck of at least six years of age on the ranch that I knew of, I resigned myself to focusing on management bucks that needed to go, and doing lots of hunting with my kids; neither of which I consider to be bad options! The next morning after the encounter with the Pirate, I moved to the West side of the ranch to try a little rattling. This was an area I had not hunted for the past two years due to the fact that my target bucks always seemed to stay more on the eastern side. In years past, this part of the ranch had also held big deer, the last of which I called Bevo, a 190 class non typical that was last seen during the 2002 season. Because he had not been seen all summer, and because we had not obtained any auto-camera photos of the deer, I assumed that this buck had also perished due to post rut mortality. Since the deer would be 7 1/2 years old, it would be natural that the rut might have been too much for him. As I climbed into the treestand in the heart of his area, I could not help but wonder if my suspicions were correct. Jason Huntsman, my cameraman, and I prepared for the first rattling sequence. I brought the antlers together with great anticipation, as I always do during the peak of the rut. After fifteen seconds of intense rattling on the cold, clear morning, I replaced the antlers to the peg and grabbed my Bowtech, Tech 29. We carefully scanned the woods around us to no avail. Five minutes passed, then ten. After fifteen minutes passed with no results I decided to try a follow-up sequence. Once again the antlers came together with an intense effort to convince any buck in the area he was missing out on some big action. Again I replaced the antlers and grabbed my bow. Several minutes seem to pass before I caught movement to my right, and identified it as a large buck moving in slowly. I signaled to Jason by tapping his leg. The buck was in heavy brush as he snuck in looking for the two bucks causing all the racket. Finally he stopped with his rack clearly visible. When I raised my binoculars I nearly fell from the tree! I couldn’t believe the mass, and I was undoubtedly looking at the best typical buck I had ever seen while hunting. I turned and told Jason I was going to take him, even though I had no clear shot. Now I focused on the next location that he may pass through that would give me a clear shot. Again the giant buck moved forward, only to stop with his vitals behind a large oak tree. He was getting visibly more nervous and so was I! As he now stood only nineteen yards away with his huge rack clearly visible, it was only at this moment I realized I was looking at the deer we called Bevo, only he had transformed into an almost perfectly typical buck for the first time in his life! Now, realizing he was a very mature seven year old deer, I became even more convinced he was going to bolt after not seeing the adversaries he imagined from my last rattling segment. He momentarily turned his head away and I came to full draw. I was committed now. I had only a minute or so for him to make a move that would give me a shot before I would have to let my bow down from fatigue, which would surely spook the deer. After about 30 seconds, the big buck had had enough, and reversed course in an attempt to sneak away in the same direction from which he had come. As he cleared the oak tree I settled my pin on his shoulder and let fly! With a solid hit I watched the giant bound away, and within seconds all that could be heard was my erratic breathing! I could not catch my breath, nor could I believe what had just happened. A hunt where my expectations for a kill was that of a cull or management buck had just turned into an encounter with the largest typical I had ever seen in the woods! After giving the buck an appropriate amount of time I began tracking him. With no exit wound my trailing job was painstakingly slow, but I eventually found him about 250 yards from where he was hit. He had died quickly and was laying in a beautiful part of the woods that was dominated by pine trees. Something about the way the light was hitting his antlers made him appear even larger that he was. All I could do was stare at his huge rack which seemed beyond belief to me. Needless to say, it is a day I will never forget!